LCA is on Facebook, Twitter, and the Team App! Click here for the links so you can follow us. 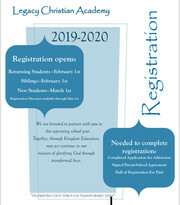 Click on pic for link to forms or go to Admissions/Registration. Tuition is due the 1st of every month. Late fees apply after the 5th of each month. When making tuition payments, only after-school care payments may be combined with tuition. Please do not combine tuition with other payments: hot lunch, field trips, sports fees, spirit items, etc. Thank you for your assistance!